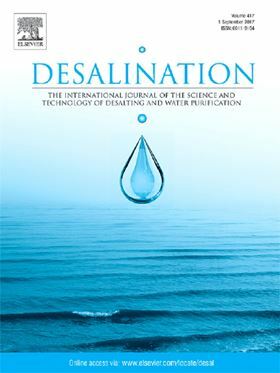 The research article 'Examining the life-cycle environmental impacts of desalination: A case study in the State of Qatar' has been published in Elsevier journal Desalination (Volume 452, 15 February 2019, Pages 238-246). Comprehensive environmental impact of thermal desalination is poorly understood in Middle Eastern and North African region, especially for multistage flash (MSF) desalination. Nearly 75% of Qatar's municipal water supply is being produced by MSF due to process reliability and other advantages, which is highly energy-intensive and creates an enormous environmental burden. Hence, this paper aimed to develop a multi-faceted, life-cycle based framework that quantifies the overall environmental and human health impacts of MSF desalination in Qatar. Three different MSF systems were examined by varying the gain ratio (GOR) through life cycle assessment. Different environmental loads were examined and evaluated, including climate change, freshwater eutrophication, fossil fuel depletion, ozone depletion, and human toxicity. The results showed that the modified MSF configuration with higher GOR released 7.32 kg CO2 for 1 m3 of water production while the plant with lowest GOR released 12.6 kg. Quantitative analysis of the environmental degradation caused by desalination reflects the reality of water use in Qatar and can motivate users to reduce their water consumption as part of the Qatar's national vision 2030. The implication of this study is particularly important at a regional level as it serves as a preliminary baseline for a more efficient water strategy.